03 | May | 2006 | Kris Johnson's Blog…sort of. I’d like my own Samwise Gamgee, if you please. I’m not carrying the one ring, or anything, so there’s very little chance you’ll have to carry me up the slopes of Mount Doom. But you shouldn’t eliminate it as a possibility. To the best of my knowledge, there isn’t a dark army bent on my capture or destruction. Nor is the eye of any ancient and powerful evil fixed upon me. Still, the future is unwritten, and it’s best not to discount any potential conflict. It’s the little things that I’m looking for: loyalty, undying devotion, and yes, even love. I’m talking about fealty. In return for all of this, I offer the benefit of my protection and a promise that I will act in such a manner as assures your welfare. Indeed I do, and let me tell you something, my wife has all of the qualities I’d look for in a vassal. She is devoted, loyal and loving. She remembers all of my siblings’ birthdays and my parents’ anniversary. She makes sure the bills get paid. She would find some way to carry me up the rocky slopes of Mount Doom if she had to. Let’s not forget the flipside. She is most certainly under my protection and I am responsible for many aspects of her well-being. So what’s the difference? Well, for starters, she’s got her own stuff going on. That’s right, she does. She’s on the church council and one or two committees. She runs a weight loss group. Now, lest you get the wrong impression, let me be perfectly clear on this: I am very much in favor of my wife having her own stuff to do. It pleases me that she has activities that don’t involve me. Her life doesn’t adjourn when I walk out the door in the morning and reconvene when I return, and that’s the way it ought to be. Secondly, we share the same bed. My wife loves me in a way no vassal would, or should. Sam loved Frodo but he didn’t love Frodo. Ah, but to have a vassal. Part chauffeur, part butler, part tinker, tailor, soldier and spy. Could you be the Watson to my Holmes? The Friday to my Crusoe? The Butler to my Fowl? The Gamgee to my Baggins? The Tucker to my Ogilvie? If so, this could be the life for you. I got a couple of requests for further information, but nothing came of it. Then, I had an epiphany. A couple of days after I posted the vassal job notice, blob and I were discussing Lobot (which happens more often than you might expect), and it occurred to me that he’d be perfect for the job. First off, he’s a cyborg, and that means I could control him with my watch. Press a button and he wakes up. Oh yeah, he’s just standing in a corner, looking like he’s asleep until I press that button. And then his eyes just open and he’s ready for action. Second, Lobot is cool. I mean, just check this out. See what I mean? He’s cool. Ears? Doesn’t have ’em. Instead, he’s got a wraparound electronic gizmo. And he’s bald, because that makes the gizmo look ten times cooler. And that gizmo is what’s going to enable me to control Lobot with my watch. Press the button, gizmo blinks, Lobot’s eyes open. It’s just that simple. Third, he’s a cyborg. Really, nothing else matters. He’ll be absolutely loyal until his programming goes haywire and he becomes a death machine intent on exterminating me. And a malfunctioning cyborg bent on destroying someone may be even cooler than the regular, loyal kind. Now, where does one order a Lobot? As it turns out, ordering a Lobot isn’t as simple as you might expect. Pues he hecho claramente en mis comunicaciones anteriores usted, Comercial Lobot, S.L. no fabrica ni vende cyborgs, ni somos capaces de proporcionar la información con respecto cómo usted puede ser que construya su propio cyborg. Observe por favor que ésta será mi comunicación final con usted, y que el resto de las investigaciones serán dirigidas a nuestro departamento jurídico. What does all that mean? Probably that I don’t have the level of security clearance necessary to purchase a cyborg. I suppose that’s reasonable. After all, we’re talking about some pretty serious technology. 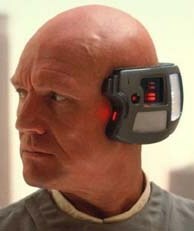 In the wrong hands, Lobot could wreak havoc; an unscrupulous individual might use Lobot for evil. Okay, so the thought had crossed my mind. But only briefly. That was two years ago, and my Lobot situation has not improved. Why am I bringing this up now? Well, my birthday is only a few days away, and I often draw a blank when people ask me what sort of gift I’d like. As you might expect, it’s not possible to put a Lobot on your Amazon.com wish list (they don’t seem to have an ISBN/ASIN), so there’s no handy reminder of my desire to have a Lobot of my very own. If you’re reading this and you’ve got clearance for cyborg procurement, keep in mind that it would make a perfect gift. Almost as good as the iPod I got for Christmas a couple of years ago.